In order to minimize duplication, consolidate resources and strengthen industry representation to government, the South African Avocado Growers Association (SAAGA), South African Litchi Growers Association (SALGA), South African Macadamia Growers Association (SAMAC) and the South African Mango Growers Association (SAMGA); amalgamated under an umbrella organization called Subtrop. This paper focuses on the effect the amalgamation had on Extension services to the abovementioned organizations. The effect was measured by conducting a survey which measured Subtrop member responses. The survey used a structured questionnaire which was completed individually at group interview sessions. Farmer and opinion leader respondents provided their perceptions and rated the extension services of the Technical Department of Subtrop. Respondents indicated that the study group as well as individual advice on farm practises as their preferred approach of the Extension service of Subtrop. A total of 54% of the respondents rated advice on farm practises as very important while 69% rated the study groups as very important. The efficiency of study groups were all rated higher after the amalgamation. More farmer respondents (64%) than opinion leaders (42%) indicated that they do not use the Subtrop website. Based on the findings it is recommended that Subtrop and its stakeholders need to develop an extension policy and strategy to ensure the deliverance of a service of excellence to its members. Subtrop is an umbrella organization that originated when the South African Avocado Growers Association (SAAGA), South African Litchi Growers Association (SALGA), South African Macadamia Growers Association (SAMAC) and the South African Mango Growers Association (SAMGA) amalgamated on the 1st of October 2006. Before this amalgamation, each of the Growers' Associations had its own offices and staff. A major reason for the amalgamation was to minimise duplicated common services such as research coordination, extension, marketing, management and to strengthen industry representation when dealing with government. Subtrop consist of approximately 800 farmer members served by a Technical Manager and six Extension Advisors. In order to measure the impact the amalgamation had on the extension services, a survey was implemented. The survey included Subtrop members i.e. farmers and opinion leaders, as well as the Subtrop Extension Staff. 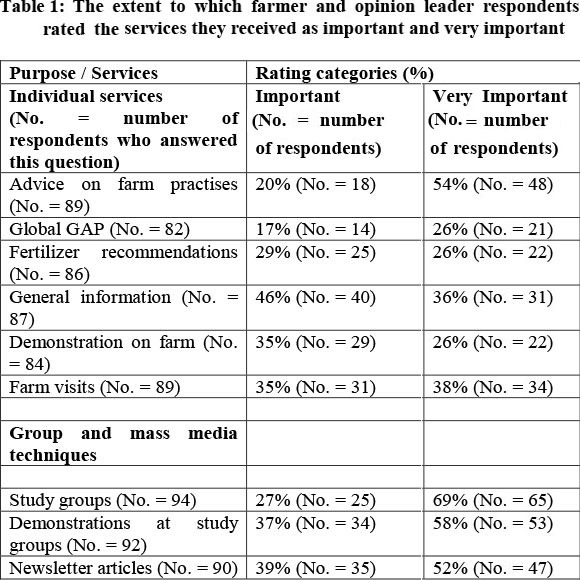 This paper will only examine the results from the farmer and opinion leader respondents. To provide recommendations for an improved Subtrop Extension Service. The Florida Cooperative Extension Service (FCES) in the United States of America has measured its quality of services since 1988 (Galindo-Gonzalez, Israel, Weston, and Israel, 2011). Their performance standard is that 92 % of their farmer clientele must be "satisfied" or "very satisfied" with the quality of extension services. Some attributes of quality measurement are 1) relevance, 2) accuracy 3) quality 4) impact and 5) overall satisfaction (Galindo-Gonzalez, Israel, Weston, and Israel, 2011:2). The results of these customer satisfaction surveys enabled Extension Service to identify, prioritize and provide solutions that meet the expectations of their clients (Galindo-Gonzalez, Israel, Weston, and Israel, 2011; Israel, 2007; Kato, 1997). The Florida Innovation Group, a non-profit organization that assists county and city governments in Florida, suggested the use of customer satisfaction survey results to assess the performance of local departments, such as the Extension Services (Israel, 2007:1). The use of customer satisfaction measures are also used as a key component of performance measurement of extension personnel and in the continuing process of program accountability (Israel, 2007; Terry & Israel, 2004). As agriculture is a dynamic environment, it is important that extension services stay ahead of changes and evolve as well (Jones, Diekmann & Batte, 2010). Customer satisfaction survey results have indicated that 1) relevant topics 2) communication methods and 3) type of farm/farmer informational needs, could improve the use of extension resources and services (Jones, et al, 2010). The implication therefore is that the targeting of information products and methods may improve the performance of extension programs and customer satisfaction (Jones, et al, 2010). The above examples emphasise the benefits and use of customer satisfaction surveys. It is therefore with the aim of improving the Extension Services of Subtrop, that a customer survey was conducted. The surveys were conducted in the main Subtropical fruit production areas of Limpopo Province, Mpumalanga Province and KwaZulu Natal. Levubu, Tzaneen and Hoedspruit were surveyed in the Limpopo province. In Mpumalanga, surveys were conducted in Malelane and Nelspruit. KwaZulu Natal consisted of both the North and South coast regions. The survey was conducted at study groups in the areas mentioned above. According to Terblanché (2007) study groups are an efficient platform to conduct surveys of this nature. Opinion leaders in each of the study areas were surveyed via email. Opinion leaders were included in the survey to determine if any correlations exist between the perceptions of farmers and that of the opinion leaders. The opinion leaders were chosen on the grounds of their accessibility to other farmers and their expertise. According to Düvel (1998) accessibility is a key dimension of opinion leadership; this attribute is negatively correlated with knowledge or expertise. It was therefore important that the accessibility of the chosen opinion leaders were positively correlated with their expertise. A structured questionnaire was developed and used for the survey at the study groups and emailed to opinion leaders. The questionnaire consisted of mainly closed questions using Likert-Type scale response answers (Vagias, 2006), as well as open questions. Prior to the study the questionnaire was thoroughly discussed and validated with Subtrop management, subject matter specialists and relevant statisticians. It was piloted with six farmers in KwaZulu Natal before finalization. The target farmers in KwaZulu Natal were chosen as they had no prior access to a subtropical fruit Extension Services. It was believed that if they could use the questionnaire, members familiar with an extension service would as well. The data was coded and captured using Microsoft Excel. These data were analysed using the SPSS V19.0 statistical package. The Pearson's Chi-square test was used to determine any relationships between farmer and opinion leader respondents and their responses to each question. However, the Pearson's Chi-square test needs large samples to be accurate. The Fischer's Exact test was performed to compensate for the relatively small sample which is problematic when using the chi-square test (Field, 2009:690). The sample was 127 respondents i.e. 16% of total membership. ii) It was indicated by 72% farmers and 87% opinion leaders that they use the Extension Advisors. Table one below provides a summary for which purpose the respondents use the Extension Advisors and the importance of that service. The Fischer's Exact test was done on each of the individual and group media services. There were no statistical differences between the farmer and opinion leader respondents' ratings. Table one demonstrates that Subtrop respondents rated advice on farm practises (54%), farm visits (38%) and general information (36%) as very important. Group and mass media techniques were all rated >50% very important. However, on the individual services only advice on farm practises received a rate (54%) higher than 50% as very important. Therefore, both respondent groups indicated group techniques as well as individual advice on farm practises as their preferred approach of the Extension Services of Subtrop. Extension Service after Subtrop amalgamation: 83% (above average, 49% and excellent, 34%). This results in a 34% increase from 49% before to 83% after amalgamation. However, Subtrop's vision is to provide an excellent service and not one of above average. These results indicate room for improvement. iv) The Subtrop study groups were all rated higher after the amalgamation. v) The Subtrop newsletters were all rated higher after the amalgamation. This indicates that the newsletters are relevant and the Subtrop amalgamation improved them. SAMAC research was rated as 13% more relevant to industry than to farming enterprises. v) The rating of the research function was higher after the Subtrop amalgamation. Do not know the website address (15 respondents). iii) The respondents who did use the websites indicated that they used them for technical knowledge and market related information; and iv) The respondents who use the websites also indicated that they were satisfied with the standard of the website, as well that the website was user friendly. The Technical Extension Services received the highest rating of all services provided to the Subtrop farmer members. The Subtrop respondents (farmers and opinion leaders) indicated their satisfaction with the Extension Services and study groups. The farmer respondents were generally unaware of how the research function of Subtrop operates. Perceptions were that the research had more relevance to the broader industry than to farming practice; yet, the Research Committees are comprised mostly of the farmers themselves. The newsletters were indicated as a relevant extension communication tool, while the websites proved to be somewhat valuable. This survey seems to indicate greater farmer involvement with extension. A farmer in the Cape Province, South Africa, reported that he was enabled to make important decisions for his own farming business through his involvement. (SA Fruit Journal, 2011:95-96). Study groups have many advantages in the sense that producer problems are identified discussed and resolved (Marsh & Pannell, 1999; Hoffmann, Lamers & Kidd, 2000). Grobbelaar and Koch (1989) stated that people become involved when planning is done with them and not for them. This could explain why Subtrop farmers are passive participators in the planning of study groups. In order to increase farmer involvement in study group management it is submitted that each area form a commodity study group committee. Combined newsletter: a combined quarterly newsletter is recommended. Each commodity will retain its own section and identity in this newsletter. This will not only reduce costs, but will also save on the extension advisor's time for writing articles. A combined newsletter will also provide farmers with an opportunity to experience and "cross-pollinate" with other Subtrop commodities. Research committees in respective areas to be appointed by farmers at study groups: The survey indicated low farmer participation. It is suggested that farmer involvement be enhanced in some way. Information and progress report articles on research in Subtrop newsletters: Newsletters can be used to provide feedback on research projects to farmer members. The survey indicated some unawareness of the websites. Therefore, it is recommended that the websites and their content be promoted at study groups and at symposiums. Based on the findings of this survey, it is recommended that relevant Subtrop stakeholders hold an extension workshop the outcome of this workshop can be used to develop updated policy, strategy for the extension services. In Australia and Germany, farmer participation and involvement in setting extension policies and priorities has resulted in favourable results (Marsh& Pannel, 1999, Hoffmann, Lamers & Kidd, 2000). However, Vanclay (2004) stated that farmer representation does not necessarily mean participation. To avoid duplication, the suggested area committees could combine the role of research and study group committee per commodity. Therefore, an area with the full representation of four Subtrop commodities will have four area committees. Where relevant, sub-areas may have their own committee from which a representative will be selected to serve on the area committee. Annual customer satisfaction surveys should be performed to evaluate progress and make improvements in extension programmes where necessary. Customer satisfaction surveys can also be used to establish the impact extension programs make in the farming community of Subtrop (Radhakrishna, 2002). It has been suggested that Extension Services should benchmark on three important aspects: 1) the relevance of extension programmes, 2) the quality of the extension programmes and 3) the accomplishments of these extension programmes (Radhakrishna, 2002).